We usually respond within 24 hours on weekdays. Unique Customizable 3D World Map for Wall Decoration Made of Wood This cool indoor wall decoration is created to add some style to your interior design with its dramatic 3D effect, impressive size and true-to-life details realistically depicting all the countries of the world. It is a perfect gift for those people who travel much around the world and want to share their experience through the stylish piece of art. 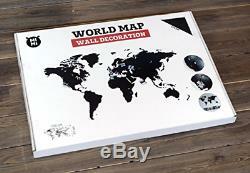 The wooden world map comes in a large presentable package that also includes 48 tridimensional stickers designed in various colors and styled as GoogleMaps tags. You can use them both to mark the places you are going to see or have already visited and to fix your memorable photos from those places. The tags can be stored in a decorative holder mounted on the wall, so you can tag new countries after each journey. This is a deluxe decoration for living room or for office that also boasts other unique features. 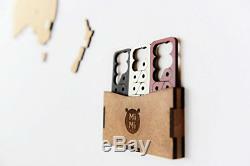 All the details are made of natural wood (high-density fiberboard). The top quality and accuracy are provided due to precise laser cutting technology. The unique large-scale design combines the stunning 3D effect and tremendous literalism. The map blends perfectly in many interior styles, while can be repainted in any color to match your existing design. The DIY wall decoration is easy to install, as all necessary tools are provided in the package along with its clear instruction written in English and several other languages. For fast and easy installation we provide a sticker strip to help you with positioning the map on the wall. Small and large limiters serve to easily push the map details out of the frame during the mounting. A bottle of quality glue ensures reliable and durable adhesion. 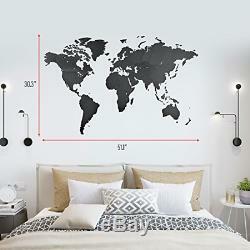 You can be sure that your decoration will not fall off the wall, unless the wall falls with the map still on it! - Upscale 3D indoor world map of a detailed design is created as a stylish wall decoration for living room or for office. Awesome wooden map with countries features a large size of 51,2 x 30,8 inches to deliver a spectacular look. 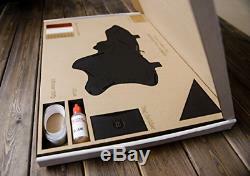 DIY world map is eco-friendly and boasts premium quality since it is made of wood using extremely precise laser cutting. Travel edition includes the customizable map with colorful Google Maps-styled tags and a decorative tag holder. The art décor is easy to mount following a multi-language instruction and using tools provided in a large gift package. 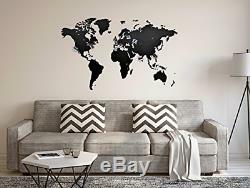 World Map Wall Art - Wooden World Map Decor / Wall Decoration / Wooden Decor for. The item "World Map Wall Art Wooden World Map Decor / Wall Decoration / Wooden Decor for" is in sale since Saturday, January 5, 2019. This item is in the category "Home & Garden\Home Décor\Posters & Prints". The seller is "allonespot" and is located in Multiple Locations. This item can be shipped worldwide.